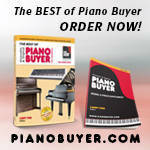 Register Log In Piano World Home Page Forums Piano Forum The blindfold test. I definitely wouldn't be able to identify by sound. I'm not so sure I could identify by playing either, as it seems there is a lot of variation even within a brand. Still, I do feel that most of the Yamahas I have played (and that is not many), sound and play "bright", whereas the Steinways I have played are warmer. But is this because of branding or individual differences? I wouldn't know. Very interesting links! I've only been able to spend some time with the six Finalists, and when each played one of six different 18th Century/Mozart Concertos, five (1st, 2nd, 4th, 5th and 6th prize winners) chose the Fazioli and one (3rd prize winner) chose the Shigeru Kawai. No doubt that for Mozart, the clarity and singing tone of that particular Fazioli is striking to virtually all the contestants (and myself). Hands down winner for this era of music. When it came to 19th/20th Century Concertos, three chose the Hamburg Steinway (1st, 2nd, 5th prize - playing Prokofiev 3rd/Rachmaninoff 2nd), two chose the Fazioli (4th, 6th prize - playing Saint-Saens 2nd/Brahms 2nd), and the same (3rd prize - playing Rachmaninoff 2nd) contestant chose the Shigeru Kawai. I found it intriguing that the 1st and 2nd place winners chose Fazioli/Steinway, whereas the 3rd and 4th place winners stuck with the same instrument (Shigeru Kawai/Fazioli). The Hamburg Steinway D power and tonal shading really shines with the large Russian works, the Fazioli with the more lyrical and singing Saint-Saens 2nd, and I felt it was a very interesting selection of the Fazioli for the Brahms 2nd. Goes to show you that different instruments with differing tonal qualities can work better for some types of music and less well for others. Perhaps someone else can fish out some of the earlier round comparisons of the Mephisto Waltz No.1, Prokofiev's 6th Sonata, Gaspard de la nuit, etc. played on the Fazioli, etc. Brahms on the Fazioli struck me as an odd choice as well. I want to play on a Shigeru Kawai so bad. That was fun. I got all four right with just one listen, but knowing the four that would appear made that not so difficult. All four sounded very good. But there are distinct characteristics to makes and if you listen to lots of them, you pick up on their distinctive sound. 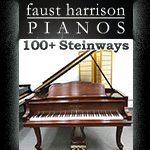 There are so many beautiful tonalities among the great pianos. My favorite of those four is the Steingraeber. Might be a different story if Fazioli 278 or Mason CC were in the mix, but that Steingraeber would be a tough one to beat to my ears. I ask because so often people talk about the "bright" or "warm" or "clear" tones that are associated with particular brands. If the tone is so particular, can you identify it blindfolded? I probably couldn't. 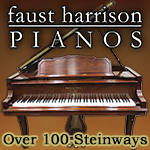 I've been doing a lot of "eyes-shut" testing of pianos with very deliberate listening now I'm almost at the end of my piano hunt. I can honestly say that it's a case of a sound I like, don't like or am neutral about, although I probably couldn't tie it down to manufacturer in a proper test. I could definitely tell the difference in touch and response between a number of the pianos I've tested, though. Just a note: none of the finalists selected a Hamburg Steinway to play their Mozart concerto in the Sydney Competition. Both are great pianos, but I much prefer the Steinway here. The Shigeru's treble is a little thin and metallic in comparison to the Steinway, particular at louder volumes (which are needed to project over the orchestra in this piece). Last edited by adamp88; 09/02/16 09:35 AM. Unless practiced, I doubt anyone could accurately identify brands by sound alone. It is not the only factor when people buy of course. If it were, if people made the choice solely on the sound alone, they could easily end up with an unthinkable brand they would never have considered otherwise. How, though, can you isolate the piano from the performer? I would like to see Maria João Pires play the same piece on both the Steinway and the Shigeru. I don't think you can isolate the two. 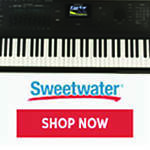 An experienced pianist will likely find the 'sweet spot' of the piano he/she is playing and modify his touch to get the sound quality he wants. I play on a wide range of pianos, of which two are on a regular basis - my own (a high-end digital ) and the C.Bechstein grand that I perform on once a month. The latter (which is re-built, and over a century old) has a mellow tone through its range, and shallower key-dip compared to modern pianos (and has only 85 keys and two pedals). Despite being over six feet in length, it doesn't have the depth of tone of the Fazioli F156 I occasionally play on, nor has it got the latter's tonal and dynamic range. So, I can't 'pull out all the stops' on it the way I can with modern grands, or indeed, my own digital. But its tone is, in its own way, very sweet (and 'olde-worlde'), and I want to make full use of its qualities when I play on it, not make it protest. So, when I play on it, I modify my touch and often have to work harder to produce the desired singing tone in the melody when there is a very busy accompaniment (especially if the melody is in the middle of the texture) by lightening the accompaniment a lot and stressing the melody much more, relatively, otherwise the melody gets submerged. Whereas with the Fazioli - or the K.Kawai that I also play on occasionally (but to a somewhat lesser extent), or my digital, I only have to stress the melodic line just a little to get the balance right. It's all done unconsciously as I'm used to the pianos, but I look for different things from different pianos, and never try to make them do what they can't, or 'dislike' doing. Just like humans, in fact .